https://democracynow.org – This week Democracy Now! is broadcasting from the U.N. climate summit in Katowice, Poland, where the U.S., Saudi Arabia, Russia and Kuwait have blocked language “welcoming” October’s landmark IPCC climate report that warned of the catastrophic effects of a global temperature increase of 1.5 degrees Celsius, beyond which global crises could unfold at a rapid pace. The four countries rejected using the word “welcome,” insisting that members instead “note” the findings of the widely cited U.N. report. 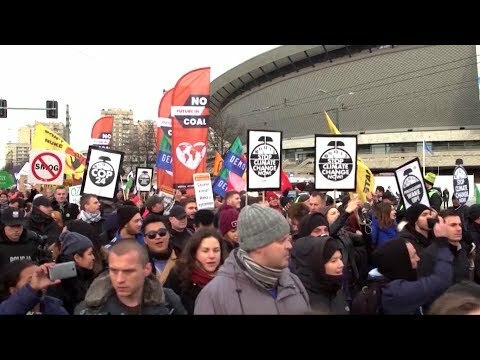 We begin our coverage with voices of some of the thousands of climate activists from around the world who marched in Katowice on Saturday, calling for world leaders to do more to keep rising greenhouse gas emissions in check. We also speak with a member of the European Parliament who confronted undercover Polish officials who were monitoring the protest.